I'm attempting to produce Blu Ray files of my completed Fanedits, but I'm having a major issue with the output quality. I've tried rendering from both FCP and Compressor, but when I do so, the final file size is around 13GB (for a 120 min movie), which is about half what it should be, and the picture quality when burned to disc is much poorer than the 1080 m4a file of the same movie. I've checked the settings of the project and its 1080. If you can provide a screen cap of Compressor Video settings then I'll compare to my settings when I produce something. If that seems too complicated, just check the bitrate of the file you got last time (the 13GB one). A bit under double that should work for your bluray. I'm not a FCP user either but doesn't it say in the upper right that the file will be around 21gb? Those are definitely the settings yielding the smaller file, right? 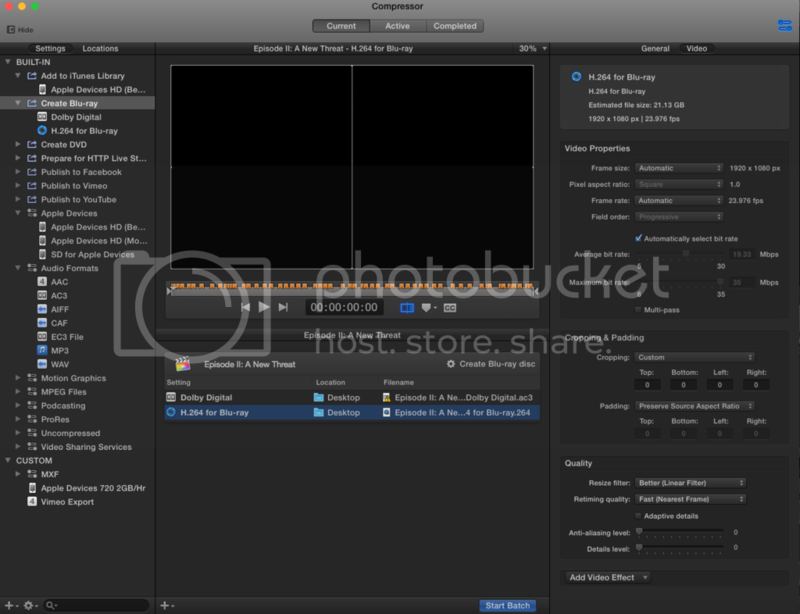 thecuddlyninja Wrote: I'm not a FCP user either but doesn't it say in the upper right that the file will be around 21gb? 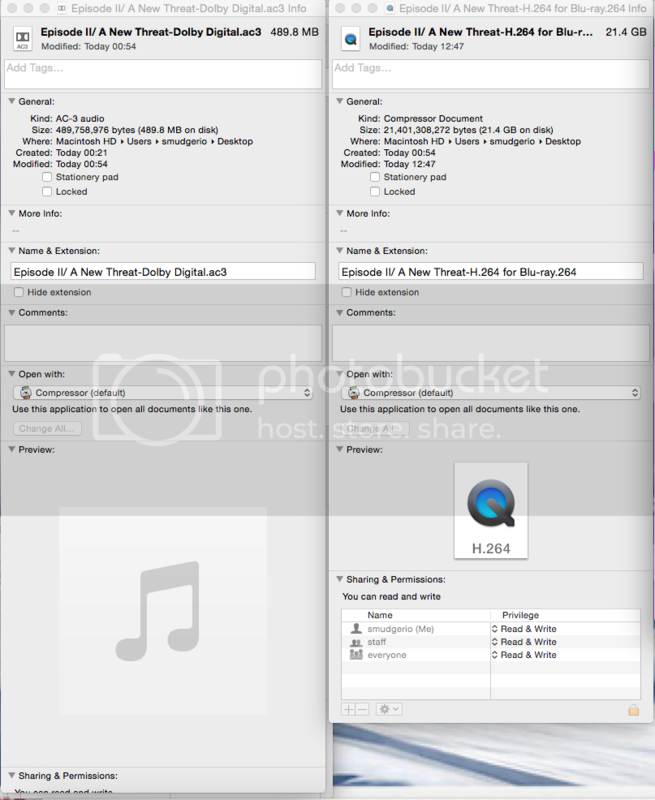 Those are definitely the settings yielding the smaller file, right? I saw that, but it must be messing up the predicted output size somehow. A 120 minute movie should fit on a BD25 at a bitrate of ~24000 kbps. The screenshot says it is encoding to an average of 19000 kbps, which should be larger than 13GB. Did you check the media properties of the 13GB file to see if it is actually encoded at 19 mbps? Afraid I can't really add anything more to this. I tend to go for the automatic settings too, it does appear to me that as a default it will aim for a target estimated size of around 21G and adjust the average bit rate to achieve that. If you increase the average bit rate so the estimated size goes over 25G then you get a warning, and have to specify dual layer in the BD main screen. Why you are getting a much smaller size and loss of quality, I don't know I'm afraid, everything looks okay. Sorry, not much help. ThrowgnCpr Wrote: I saw that, but it must be messing up the predicted output size somehow. A 120 minute movie should fit on a BD25 at a bitrate of ~24000 kbps. The screenshot says it is encoding to an average of 19000 kbps, which should be larger than 13GB. Did you check the media properties of the 13GB file to see if it is actually encoded at 19 mbps? Not sure what compressor is doing. I set 24000 and it produced a 16GB file! Go figure. smudger9 Wrote: Not sure what compressor is doing. I set 24000 and it produced a 16GB file! Go figure. The output files have no "extra info", so I don't know what the bitrate is. I set the target bitrate to the maximum I could - 30Mbps and it still only gave me a combined file size of 22GB (for a 140 minute movie). Very Strange.